Optimized for Desktop and Mobile devices. Sharing of images or any HTML content in new tab or in new window with specified width and height. Possibility to define minimum allowed media size that will be used by plugin. Visibility of share button: Always or on hover. 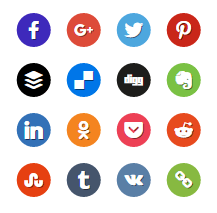 Social Button Appearance: Asymmetric, circle, rounded and square. Available effects: Blur, brightness, contrast, grayscale, invert, none, opacity and sepia. The effects are based on CSS3 filters (older browsers do not support CSS3 filters). Share to images in 15 most popular social networks: Buffer, Delicious, Digg, Evernote, Facebook, Goolgle+, Linked In, Odnoklassniki, Pinterest, Pocket, Reddit, Stumbleupon, Tumblr, Twitter and Vkontakte. You can easily share specific images or you can share full page with anchor to specific image – with auto scroll media to the visible area of the page. The order can be changed by drag and drop. You can share any html element by adding class s4ysi-share. Conversely class s4ysi-no-share prevent sharing. Automatic mode: Automatically initialize plugin after AJAX call. Works only in modern browsers. Manual mode: After every ajax page update you must call inicialization of Smart4y Share Image Plugin. tab: Open share dialog in new tab. window: Open share dialog in new window with specified width and height. You can change the window size in the plugin administration. Direct support for copying the share link to the clipboard. Possibility to change default texts – successful and failed copying text. It is possible to define image selector for specific page? Yes. Every page has specific css class in body element. For example single post type page uses the class single-post. img: All images in the page. .single-post img: All images in the single post page type. Installation and Instruction manual can be found at the download package. If you can’t find what you need please do not hesitate to contact me at support@smart4y-plugins.com. Added: Possibility to share custom title or custom media via HTML5 attributes. Fixed: Repaired share url for Delicious. Added: Possibility to copy the link to the clipboard. Added: The ability to open a share dialog in a new tab or in a new window with specified width and height. Fixed: Bad share url for Twitter. Fixed: CSS styles for admin area. Fixed: Redirecting after clicking on the sharing button. Added: Automatically initialize plugin after AJAX call.